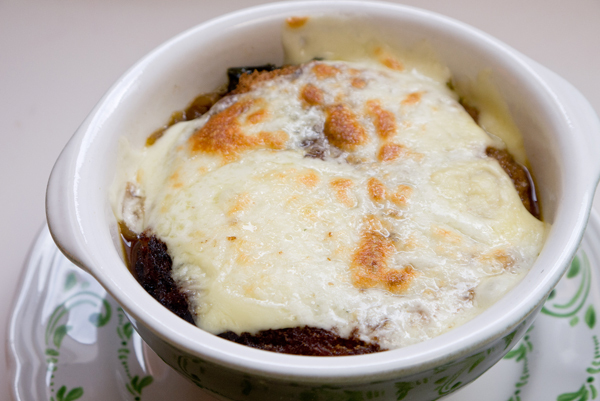 I don’t know about you, but one of my total craves is really ooey-goey French onion soup. It’s so simple and yet amazingly flavorful – and out-of-control comforting. This last week wasn’t one of the best weeks. I don’t really know why or what caused things to be so craptastic, but it just wasn’t a good week. I was craving comfort food fast. Instead of reaching for the flour and sugar and butter and eggs, I decided to go a bit healthier. Yeah, that’s right. I put a big bunch of healthy and hearty kale in my French onion soup and the result was super yummy. This recipe makes a nice big pot, perfect for a week of total comfort lunches, or enough for a couple of big bowls for dinner. And it’s really easy and ready to eat in 30-minutes. French onion soup is all about the yummy caramelized onions (well, really, it’s about the melty cheese), which is the flavorful base to the soup. 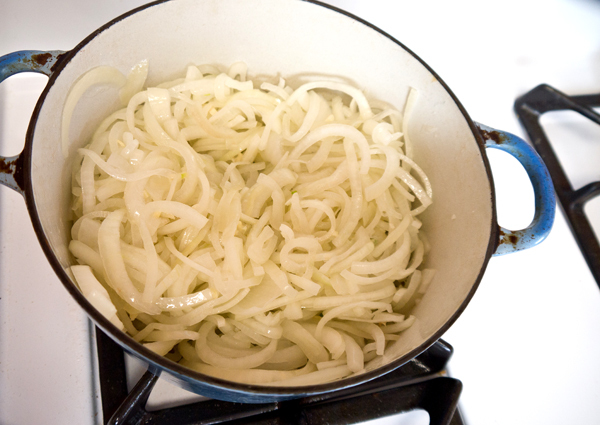 Slice the onions in half and then into 1/4-inch half round strips. Heat a large stockpot over medium heat and add the oil, sliced onions, salt, thyme, and dash of pepper. Give things a stir to coat the onions. 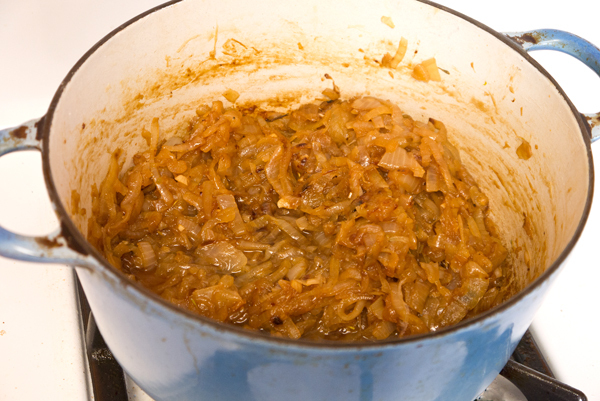 Deglaze the pan with the vermouth and stir pulling up all those caramelized bits and mixing them in with those onions. Now you can add the soy, apple cider vinegar, sugar, beef stock and water. Crank the heat and bring to a boil. Once the French onion soup is bubbling, add the kale and let simmer covered for 20-minutes. Pre-heat your broiler and dig out an ovenproof bowl, a slice of whole wheat bread, and your cheese. Ladle the hot soup into your bowl and top with a slice of whole-wheat bread (I cut the crusts off to prevent burning) and then cover the bread with two slices of Jarlsberg. Don’t have any Jarlsberg hanging around? You can cover with Parmesan or even mozzarella, and this soup is still tasty (I tried both!). Place the bowl on a sheet tray and then under the broiler. Don’t walk away – keep a close eye on your soup! Once the top of the cheese starts bubbling, you’re good to go. This is exactly what I was looking for! Thank you for creating the recipe in my head! I’ll let you know if we burn our mouths or not.